My brother was active in the family business at that time but had just left for Viet Nam so I came home to help until his return. He was almost kill in Nam and came home on a stretcher and had many month of rehab. I became very active in the business and his interest waned during his recovery. I have been here ever since. I have been very active in my community and my occupation. I served on our local draft board upon my return from the Navy until it was disbanded. 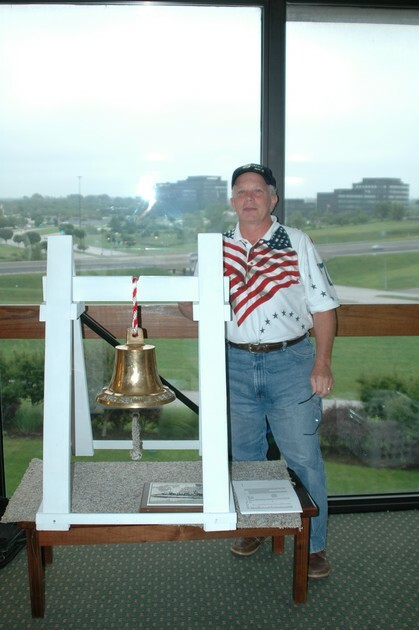 I served on our county commission of veteran affairs for twenty two years. I served on all offices in the American Legion since 1971including Commander and still serve. Other service included my church board, community theatre board, Red Cross board, and Central Business District board. In my occupation I served on the Iowa Jewelers Association for many years and offices including a two year term as president. Following that I was elected by 11 states to serve on our national association board Jewelers of America for 8 years. I want to say a big thank you for coming to Kansas City and starting the best association of shipmates that will ever be. When I conceived this idea, I knew if I called Bill, he would come. Then if I could get six more shipmates I would consider it a success. Well, I was overwhelmed with 20 shipmates from 15 states and both coasts coming together. But most of all, I am so impressed with the talent that you each bring to our group. We cannot help but grow into an awesome association when we hand it over to younger guys. Again, thank you all for all you have done and what you will do. To all shipmates that were aboard Seattle on the west coast, I believe today is the 40th Anniversary of going through the Panama Canal. For those that attended the reunion, we shared many pictures of that and the picture at the top right of this page was just before we entered the canal. Plankowner Tom Stoakley was from Panama and his mother took this picture November 10, 1969. Obituary for Hjalmar Hellberg Jr.
Hjalmar Victor Hellberg Jr., of Marshalltown, passed away Thursday, January 14, 2010, at Mercy Medical Center, Des Moines. Funeral services will be 11:00 A.M., Tuesday, January 19, 2010, at the First Congregational Church, Marshalltown. Friends may call from 5:30 P.M. to 8:00 P.M., Monday January 18, 2010, at the First Congregational Church. Interment will be in Rose Hill Memorial Gardens, Marshalltown, with full military honors presented by VFW Harry C. Harter Post #839 of Marshalltown. Hjalmar Victor Hellberg, Jr. was born on August 13,1924, to H. V. and Margaret O. Hellberg, Sr., at Marshalltown's St. Thomas Hospital. He was baptized May 31, 1925, at Elim Lutheran Church in Marshalltown. Hjally's draft call came eight days following his graduation from Marshalltown High School in 1943. He reported for active duty to The U.S. Army Air Corps on June 30, 1943, after training as an Armor Gunner at Tyndall AFB in Florida and training with a crew at Rapid City Army Air Base in South Dakota. His crew was assigned to the 8th Air Force - 379th Bomb Group, Kimbolton, England, He flew 24 missions as a ball turret gunner on the B-17 Flying Fortress. His first mission was on February 3, 1945, to Berlin, Germany, and the last mission was on April 25, 1945, to Pilsen, Czechoslovakia. That was the last mission of the war with Germany in World War II. Decorations included – Air Medal with 3 Oak Leaf Clusters, Good Conduct Medal, American Campaign Medal and WWII Victory Medal. On December 30, 1945, he was united in marriage to Edna May Bankson at the Canton Lutheran Church in Canton, South Dakota. Edna May passed away on February 18, 2005. He will be fondly missed by his 3 children and their spouses; “Vic” Hjalmar Victor Hellberg, III (Gayle), David Paul Hellberg (Dorothy), Renee Louise Sedlacek (Barry). 5 Granddaughters; Amy Harmon (Gene), Amanda DeVaul (Andy), Nicole Hellberg, Erika Lindblom (Kevin), Kelli Hellberg and 1 Grandson; Matthew Hellberg, 3 Great-granddaughters and 2 Great-grandsons. Hellberg's Jewelers was founded in 1898 by William Hellberg who came to America from Sweden. As a third generation jeweler, Hjally worked in the family jewelry store while in high school and learned the business from his father, Hjalmar V. Hellberg, Sr. He rejoined the business after returning from the Air Corps in the fall of 1945. He was dedicated to the growth of the Iowa Jewelers Association serving as Executive Director for many years organizing trade shows and seminars. He served as president in 1972-1973. Industry recognition was awarded to Hellberg's Jewelers in 1960 and again in 1961 when awarded 3rd place in the National Brand Name Retailer of the Year in the Jewelry division. Community service was important. 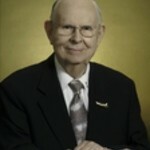 He served on the Chamber of Commerce board member in 1968-1970 and many years on the Central Business District board. 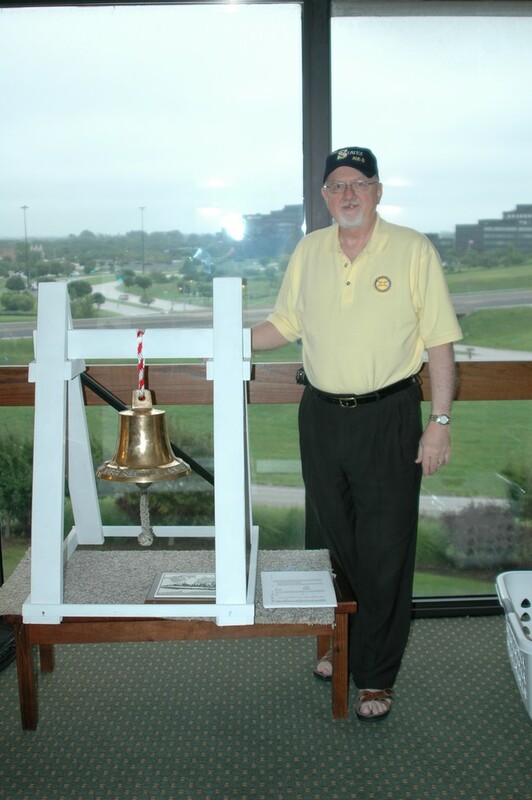 He held memberships in the Masonic Lodge, York Rite Masonic Bodies, Za-Ga-Zig Shrine, Marshalltown Noon Lions Club-President 1998-99, Lifetime Member of the American Legion, Lifetime Member of the VFW, Lifetime Member of the 8th Air Force Historical Society, Lifetime Member of the 379th Bomb Group World War II – Board Member 1984-1986 and 2 term National President 1986-1990 and member of the Marshalltown High Twelve Club, serving as president 2001-02. Extensive travel within the United States and many trips to the Scandinavian countries and Europe were highlights in his life. His hobby was collecting dirt samples. He enjoyed sharing stories of his collection sites but he will forever be remembered for his "last red cent". Our second reunion has passed. It will take a lot to surpass this past outstanding weekend and I thank you for the kind words several of you have sent me. Marland Townsend has used the words “this special group” when writing his thank you. We are indeed a special group. Two years ago, the twenty shipmates bonded in a very special way. We came from so many different areas of the ship and different vocations. We came together and became a cohesive group of friends. And Marland (Doc) became a friend to us all. He came and joined us and participated in everything including our business meetings. He has certainly set the bar for the officers of the great ship Seattle. This year we had twenty nine shipmates, fifteen were new this year, a 53% growth! That is terrific, especially when we have to discover our members one at a time. It also sets this bar very high for us next year. The two sailors from the middle 80’s are our hope for the future. We need to start right now, each and every one of us, searching for more shipmates. shipmates to join us and help make our veterans association the best of them all! Next I need to thank the reunion committee of Paul Hedden, Stu Tyson and Dave Caldwell. Paul and Stu did the early legwork in finding a location and tours. The real work horse was Dave. He lives very close and made all the arrangements. The choice of the banquet facility, securing the color guard, finding the restaurant for the Friday night event and working with the Public Affairs Officer and banquet coordinator were among his many duties. There was very little left to do when we arrived. Thanks, Dave, for a job very well done. Two other people stand out. Jim Pease did much behind the scenes work donating table decorations, door prizes, and invocation. George Hastings always keeps us on the right path, legally, during our meetings. He purchased tickets and implemented his idea to do a 50/50 fund raiser which netted us over $600.00 for our treasury. As you can see, we have a dedicated group. All those that attended were so very supportive. I know there is much talent in our group and believe me we will tap on it for our future. Everyone reading this is part of that group even if you were not in Bremerton. Mark your calendar right now for next September 9 and 10, 2011. Our 3rd reunion will be held in Norfolk, VA, where it all ended for AOE-3. The 2012 site is New Orleans, La. Lastly, unless your name is on the Certificate page, you are a guest of the website and have not joined our association. To be part of our great organization is very easy. Log onto our website, click on our “Reunion 2011 & Store” page on the left side, slide to the bottom slowly looking at all the unique items we have in the ship’s store. The ordering area allows you to purchase your membership. It is the first item on the list. Click the down arrow and select the number of each item. Hit “continue” at the bottom and the rest is simple.